What do Stephen Sondheim, Abe Lincoln, munchkins and ambivalent lesbians all have in common? They all get the McKeever touch in this hilariously funny collection of the award-winning playwright's most celebrated short plays. 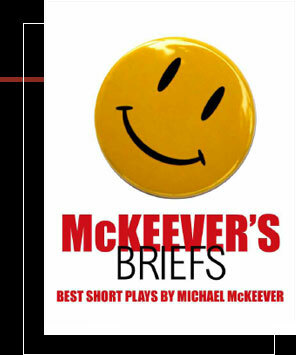 With a wicked sense of humor and razor sharp insight, McKeever's Briefs takes apart and reassembles an entire series of loveably flawed characters and pop culture icons with hilarious results. Six actors play twenty three different roles. "A fun and hilarious time for all." for more information and production rights, please go to contact.